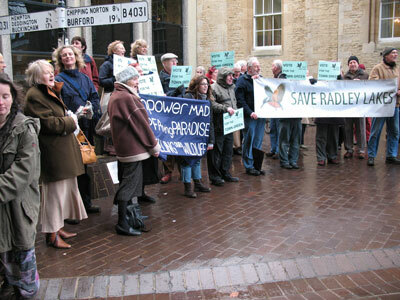 Campaigners said today that they would take the battle to save Radley Lakes to the High Court after Oxford County Councillors resolved to reject the application to register the area as a Town Green. At a meeting packed with members of the public, Oxfordshire County Councillors voted 10 to 4 to reject the application. They also rejected a motion to defer a decision until they could see the site for themselves, and voted not to take further advice on a disputed legal point. The voting was strongly along party lines with all nine Conservative councillors present, joined by one Labour councillor, voting to reject the application. Save Radley Lakes is asking its lawyers to consider urgently how the County’s decision can be challenged by a judicial review in the High Court. In a message delivered to the meeting on his behalf, MP for Oxford West and Abingdon, Dr Evan Harris, expressed strong support for the application and urged campaigners to appeal if the County Council decided to to reject the application. Dr Harris offered his full personal support for any such action. RWE npower, operators of Didcot power stations, who are proposing to destroy Thrupp Lake by filling it with fly ash had previously indicated their support for the democratic and legal process are being called upon to desist from further damaging the site until the matter is finally settled in the courts.